Atom is a special clay cleaning compound, designed by Lynx Heli Innovations, and is based upon the cleaning properties of clay materials, allowing the removal of harmful deposits helicopters product and attract throughout various flight regimes. How Does Atom Clay Work? Thanks to Lynx Heli Innovations elaborate clay composition, this particular clay can absorb any type of dust, grease, oils, fuel deposits, thread locking compounds, and other such harmful particulates from your helicopter after a flight. The adhesive qualities of the clay compound allow the clay to cover all aspects of your helicopter, along with very difficult to reach areas that are often overlooked due to their restrictive access. Why Atom Clay Differs From Other RC Cleaning Clay? Early on, we began testing clay compounds designed for RC cars that were used for cleaning purposes, but immediately saw that the clay began to prematurely break down, becoming too soft to properly apply when used with Nitro helicopter applications. Lynx began studying the chemical reaction of this clay when in use with Nitro helicopters, and after studying the areas of weakness when in use with nitro helicopters, new compositions were tested that behaved far better during the absorption of dust, fuels , greases and oils, allowing the clay to maintain its original composition & structure throughout the cleaning process. After a full year of testing, Lynx arrived at a new clay composition that had all the essential elements needed to properly absorb contaminates RC helicopters are exposed to throughout their flight regimes. This new clay composition not only absorbs harmful contaminates that are accumulated throughout a flight, but the clay itself also incorporates anti-bacterial properties to prevent strong odors, and to also increase the life of the clay. How Do I Use Atom Clay? 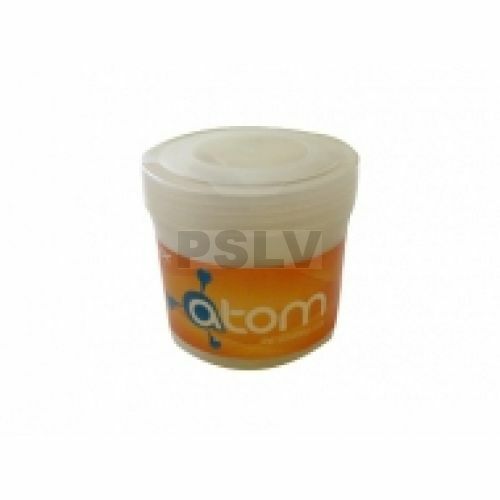 Atom Clay Compound is a very simple and ready to use product – simply manipulate the clay by stretching & compressing the clay a few times over, allowing molecular friction to soften the clay for better absorption properties. Once the clay is soft and malleable, simply push the clay compound over the dirty areas of the helicopter, and stretch & compress it against heavily oiled areas on the helicopter, which will allow the clay to better absorb contaminates. When dirt and oil is absorbed by the clay, simply manipulate the clay in your hand, allowing the clay to digest these materials, producing new clay surfaces for further cleaning. How Long Can Atom Clay Be Used? It is difficult to quantify the exact life of Atom Clay, but Lynx has tested this Atom Clay Compound in very harsh conditions by cleaning a .90 sized nitro helicopter every day (flown 5 times a day), and the Atom clay compound withstood this day to day use for a span of 10 full months! Atom Clay has been designed for use with nitro helicopters that require cleaning of heavily oiled areas, and can be used to clean these oils by utilizing this clay compound. When the clay becomes saturated with oil, simply flatten the clay in a circular shape to around 10m thick and envelope the clay in a paper towel, which will absorb the excess oils. Leave the clay in a warm, dry place (direct sunlight or near a heat source) while enveloped in a paper towel for a few hours, and the clay will be ready for further use. When Atom clay is not being used, we advise storage in the original container, which will maximize the life span of the clay. Where Lynx Suggests Using Atom Clay?